Magnus Carlsen is on the verge of another great tournament victory. The World Champion leads Levon Aronian by a point at the Zurich Chess Challenge after defeating Nakamura and Caruana. We take a look back at all the week’s events, with some exclusive analysis from Rustam Kasimdzhanov. The Zurich Chess Challenge has so far featured both top-quality and hard-fought chess, with seven out of the 12 games ending with a winner. With the right players – e.g. Carlsen, Nakamura or Caruana – and minimal rule changes e.g. discouraging draws before move 40 – it’s impossible to talk about the draw death of chess as people were wont to only a couple of years ago. It would also be somewhat awkward if the grandmasters cut their work short right before the eyes of diamond magnate and sponsor Oleg Skvortsov. To avoid that likelihood if a game ends in a draw before move 40 the players are required to play a rapid game for the audience. It’s a good sign that so far we’ve only had one such game, between Gelfand and Aronian. Their classical game in Round 3 was hard fought but ended after 27 moves. The subsequent rapid game was won by the Armenian, although it has no bearing on the final standings. The name Magnus Carlsen has featured with incredible frequency on our site of late. That’s hard to avoid, as he just keeps on winning and winning. After his victory in Round 3 against Hikaru Nakamura and in Round 4 against Fabiano Caruana he’s topping the table with 7 points. Nevertheless, there’s still some tournament intrigue, with Levon Aronian in hot pursuit. 5... ♗xc3+ , although he ended up on the defensive after 6. bxc3 c5 7. cxd5 exd5 8. e3 c4 9. ♘e2 ♘c6 10. g4 0-0 11. ♗g2 ♘a5 12. 0-0 ♘b3 13. ♖a2 b5 14. ♘g3 a5 15. g5 ♘e8 16. e4 He did eventually win that game, but it required some good fortune. 6. e4 dxe4 7. fxe4 e5 8. d5 ♗c5 The position is very unbalanced. White has a space advantage but his dark squares are weak and Carlsen's bishop therefore finds a very convenient outpost on d4. The World Champion had no doubt looked at this variation with his second Jon Ludwig Hammer, who has some experience in this line. 9. ♘f3 ♗g4 10. h3 ♗xf3 11. ♕xf3 ♘bd7 12. ♗d3 0-0 13. ♗d2 c6 14. 0-0-0 ♕b6 15. ♖hf1 ♗d4 16. ♔b1 ♘c5 17. ♗c2 ♘e8 18. ♗c1 gave White an edge in Volkov,S (2614)-Hammer,J (2601), Oslo 2011. 9... 0-0 10. ♘f3 ♗g4 11. h3 ♗xf3 12. ♕xf3 ♘bd7 13. 0-0-0 This plan with long castling and later attacking on the kingside looks very promising for White. 13... ♗d4 14. ♘e2 c5 15. g4 a5 The typical opposite-side-castling battle begins. It turns out White holds all the trumps, largely due to his space advantage. 16. ♔b1 ♖a6 17. ♘g3 g6 18. h4 a4 19. ♖h2 This rook reliably defends the second rank and the b2-point. 19... ♕a5 20. ♗d2 ♕c7 21. g5 ♘e8 22. h5 ♖b6 23. ♗c1 ♖b3 24. ♕g4 Carlsen only realised at this point that the white attack is much faster and more dangerous. The computer engine Houdini already gives White a decisive advantage. 26... ♗xb2⁉ The best practical try. 30. gxf7+ ♖xf7 31. ♘h5 ♖xb2+ 32. ♔a1 ♖xh2 33. ♘f6+! ♔g7 34. ♖xh2 and Black will be mated. 30... ♖d8 31. ♕h4 ♖xb2+ 32. ♔a1 ♖xh2 33. ♖xh2 ♕g6 34. ♘f5 ♖e8 White still has many ways to win. 35. ♕g4 ♕b6 36. ♕h3 ♕g6 37. d6⁇ At first glance it seems as though this idea wins, but White gets a rude awakening. 39. ♘c8! would preserve a small endgame edge after 39... ♔xg7 40. ♘e7 ♖d1+ 41. ♔a2 ♕e6+ 42. ♕xe6 fxe6 43. ♖h6 although you'd need exceptional technique in order to transform that into a full point. 39... ♕xe4 According to the computer this position is equal, but from a human point of view Black is on top. The queen covers the only weak point on h7 and White needs to be very precise to keep Black's heavy pieces in check. As if that wasn't enough, Nakamura only had a few minutes until the time control to find the best move - and he knew full well that he'd thrown away a winning position. 40. ♘e3! Only this move would hold the balance, but it's not intuitive to put the knight on this square where it blocks the 3rd rank for the white queen. 40... ♖d3! The winning move. Black prevents White's defensive idea with 41. Qe2. 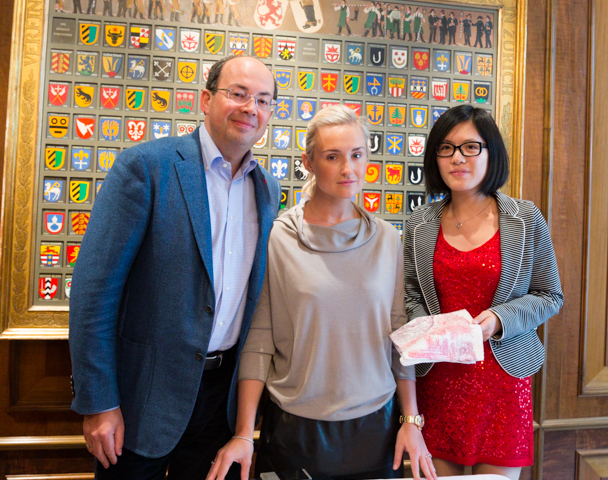 Now that Carlsen scents victory nothing can stop him. 41. ♖h4 ♕f5 42. ♕e2 b5 43. ♘d2 ♕xg5 44. ♕xd3 ♕xh4 Black simply has too many pawns for the knight. White can't hold. The two other games in Round 3 ended in draws. Aronian and Gelfand played out a Fianchetto Variation of the Grünfeld-Indian Defence. A symmetrical position was soon reached in which many pieces were exchanged. The game fizzled out with neither player having realistic winning chances. Caruana vs. Anand was much more exciting. In a Slav the players refrained from castling for a long time and provoked mutual weaknesses. Those were eventually neutralised and the players decided to seal a draw by repetition right after move 40. The star guest of the 4th round was Charles Aznavour. The French-Armenian singer has a cultural centre named after him in Yerevan and enjoys even greater cult status in Armenia than Levon Aronian – which is really something. 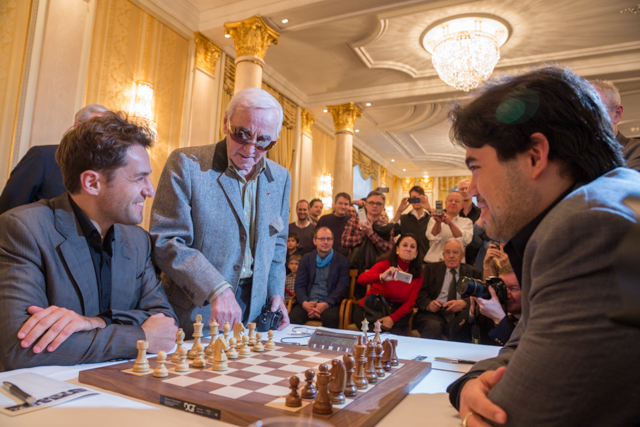 As a cultural ambassador the 89-year-old moves back and forth between Paris and Zurich and decided to visit the chess tournament. He chose the right day, as all the games ended decisively. 39. ♖xg7! ♔xg7 40. ♗d4+ Mate can't be averted. This position isn't easy for White. His king is clearly more exposed and he has more pawn weaknesses. This is a good example of how fast a top grandmaster can collapse when he has to defend a difficult position in time trouble. 31. ♖h1⁈ This looks like a normal move. White protects the h4-pawn and the plan of pushing h5 looks plausible. However, the decisive factor here is control of the f-file. 31... ♖f8 32. h5 ♕f7! 33. h6 ♕f3! The white "attack" on the h-file remains totally ineffective. 35. ♕xh6 ♕d3+ 36. ♔c1 ♖f2 with mate to follow. 35... ♖e8 36. g5 ♕f5+ and White resigned as he's losing another pawn. 12... 0-0 13. ♘xd6 cxd6 14. f4 f5 it would have been pretty equal, as 15. exf5 ♗xf5 16. g4 ♗xg4 17. hxg4 ♕h4 doesn't look like a winning attempt. 16... 0-0 17. ♕f3 f6 18. ♕g3 White gets a slight but pleasant initiative. 19... ♖c8! 20. e5 cxb3 21. cxb3 0-0 is completely fine for Black. 22. ♖af1 ♕b5! The queen landing on d3 kills off any hopes of creating an attack. 20. ♖af1 0-0-0 21. bxc4 ♕xc4 22. ♖xf7! Not at all obvious - at least to me - this shows what great feel Magnus has. The resulting position turns out to be very difficult for Black. 24... ♔xd7 25. exd5 When I saw this position during the online broadcast I wasn't at all sure that White is much better. It turned out, however, that these pawns are much stronger than they look, and the black king is much more vulnerable. Magnus concludes matters with some hair-raising precision. 32... b5 33. a4! bxa4 34. ♕e2+ ♔b7 35. c4 and the pawns will march all the way up the board. 33. ♗g3 ♖c8 34. ♕d3+ ♔b7 35. c4 Now it's over - this is the kind of army that can't be stopped.